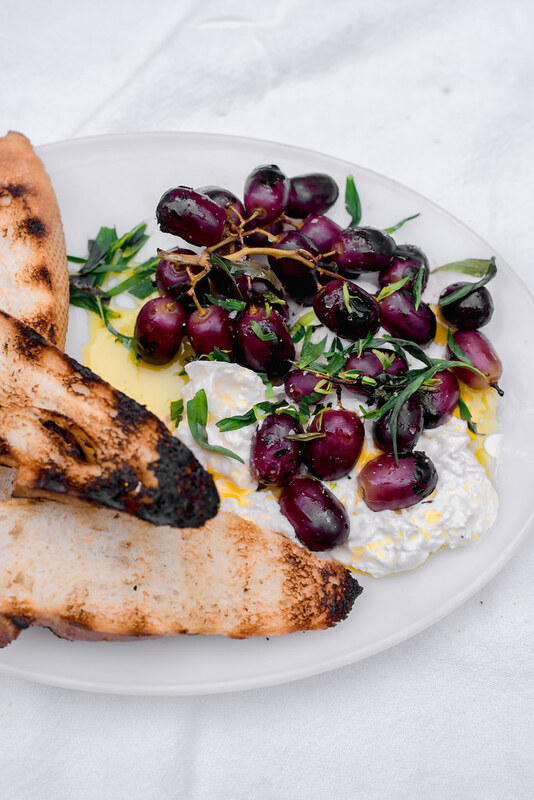 Sweet and smoky grilled grapes with burrata and tossed with fruity olive oil and elegant tarragon. Serve with crusty bread for an impressive and easy appetizer. It’s been a minute since I talked about my lovely friends new cookbook. Camp and Cabin Cookbook (affiliate link) is a gorgeous collection of easy and approachable recipes for outdoor or indoor dutch oven cooking or basically anything associated with fire! 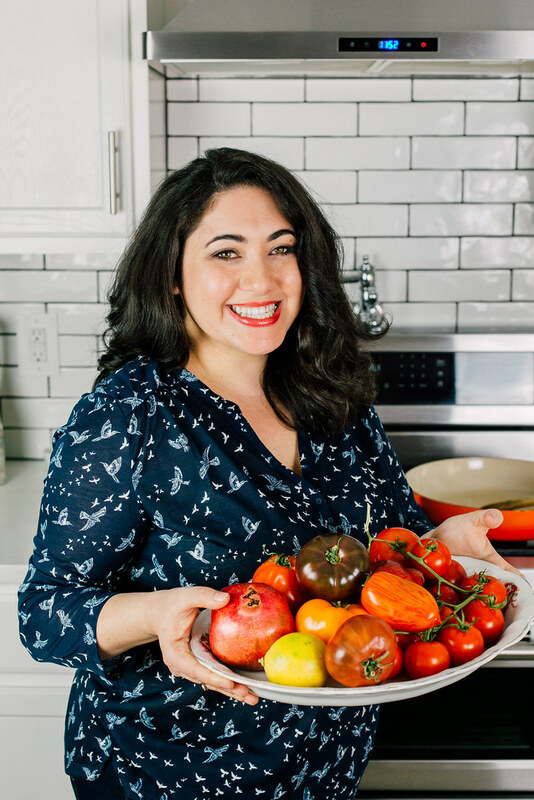 I’ve been friends with Laura since the beginning of my blogging life and I am so thrilled for her gorgeous cookbook. It is the perfect camping companion and unlike other camping cookbooks, this one has doable recipes with out a lot of pre-made, ‘need to prep-ahead’, but instead has elegant and easy to throw together staples. 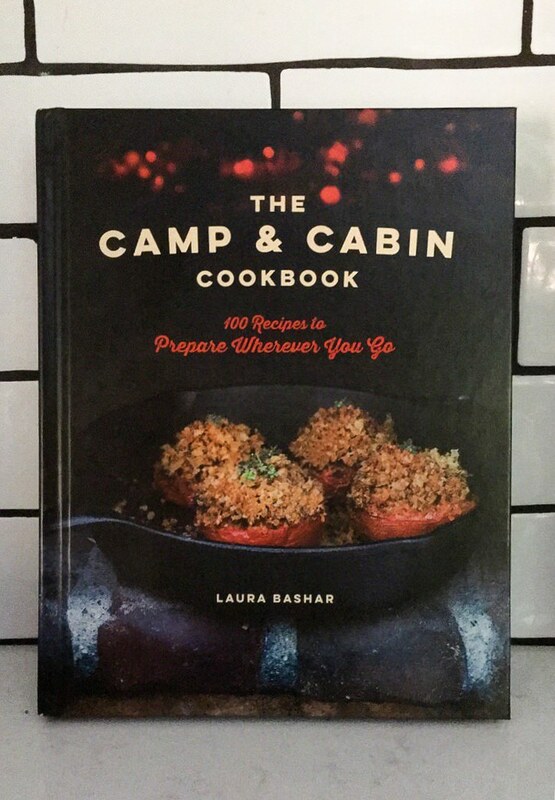 The recipes in The Camp and Cabin Cookbook are also not limited to outdoor camping, but has instructions and suggestions for cooking in your dutch oven or at home grill as well. There were a handful of recipes I was eager to make when I first flipped through, such as her green hatch chile verde chicken, that we actually made on our camping trip over the summer. But it was this grilled grapes with burrata and tarragon that ultimately won me over. I couldn’t wait for the sweet, smoky and earthy concoction and the best part, was that it was a breeze to whip up. 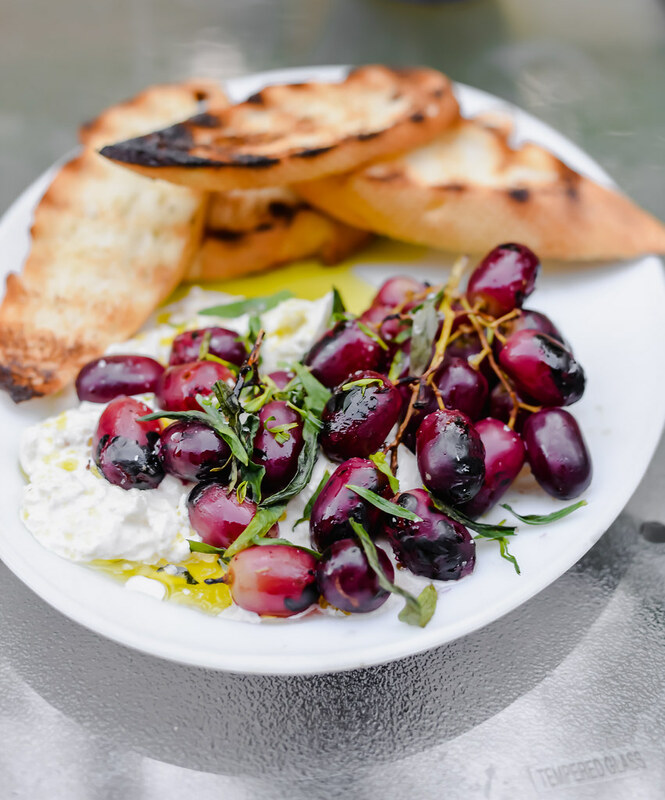 Grilled grapes will be your new favorite appetizer! It’s pretty amazing how a humble bunch of grapes transforms when introduced to heat. The high heat of a char grill instantly plumps the grapes, bringing out its natural juices and creates a gorgeous deep char on the outside. I then placed the warm grapes on top of freshly torn burrata cheese and the warmness from the grapes ever so slightly melts the cheese. And with a generous drizzle of olive oil, this is where you want to use the “good olive oil”, as Ina would say and a healthy sprinkle of fresh tarragon. The tarragon, I have to admit, took this over the top and the combination of flavors is outstanding. Prepare your grill over high heat. You can also do this with an indoor grill pan and brush with oil. 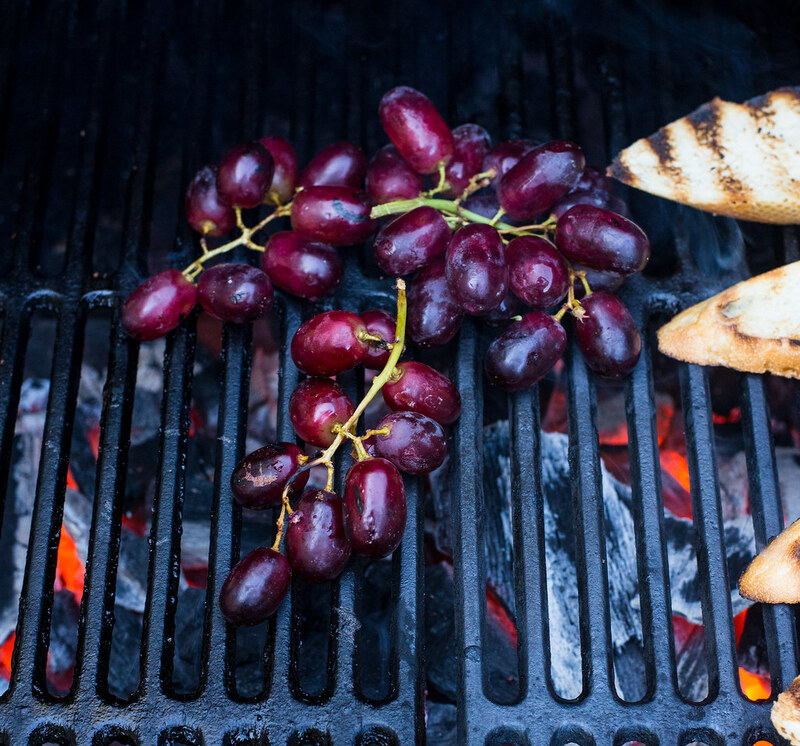 Place grapes directly on grill and cook for about 5 minutes, or until the grapes begin to plump and deepen in color. Some grapes will char and turn black as well. 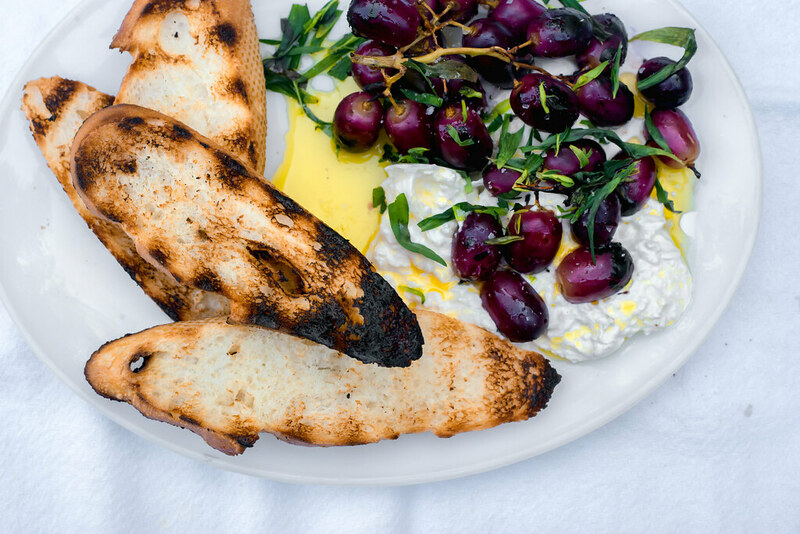 Add burrata to a bowl and place grilled grapes on top. Drizzle with olive oil and sprinkle torn tarragon leaves and season with flaky sea salt. Serve with slices of grilled bread.